NEW ORLEANS – Boom! 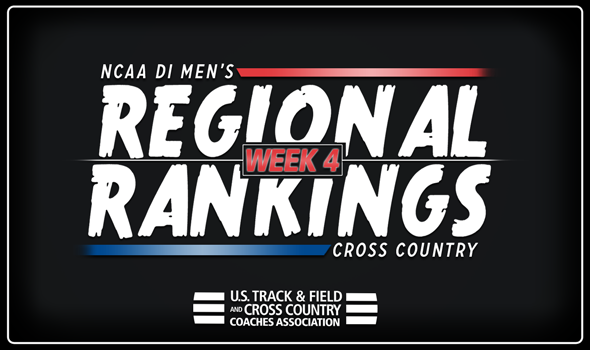 Just like that, we saw some changes in the NCAA Division I Men’s Cross Country Regional Rankings. All it took was one of the biggest weekends in recent memory to shake things up. Here is a list of meets that took place this past weekend, in no particular order: Nuttycombe Wisconsin Invitational, Paul Short Run, Greater Louisville Classic, Roy Griak Invitational, Joe Piane Invitational, Stanford Invitational. Regional foes squared off against each other and gave us a clearer picture of what could happen as the season continues to progress. Wisconsin strengthened its spot atop the Great Lakes Region with a strong performance this past weekend on its home course. The Badgers finished second behind meet champion Northern Arizona, which was their best placing at the Nuttycombe Wisconsin Invitational since 2014. Coming in second this week – and setting a program record, in the process – is Purdue. The Boilermakers surprised everybody this past weekend when they finished ninth out of 33 teams and upended numerous region foes ahead of them. The rest of the top-5 corresponds to their finishing order at the Nuttycombe Wisconsin Invitational: Michigan finished 13th – four spots behind Purdue – and is third, Indiana finished 14th and is fourth, while Michigan State finished 19th and is fifth. From Week 4 of 2015 to Week 6 of 2017, Georgetown was the top-ranked team in the Mid-Atlantic Region. Now, after a short spell in the No. 3 spot, the Hoyas return to roost. G’Town battled at the Nuttycombe Wisconsin Invitational and finished 18th, the highest place out of any team in the region. The Hoyas put their top-3 runners in 53rd, 57th and 63rd place. Villanova remains No. 2 following this past weekend. The Wildcats finished 20th in Wisconsin and had a solid outing from their top-2 runners, who finished 33rd and 51st overall. Former No. 1 Princeton fell to No. 3, followed by No. 4 Penn State and No. 5 Penn. Iowa State proved why it’s at the top of the Midwest Region and ranked No. 5 in the nation this past weekend at the Nuttycombe Wisconsin Invitational. The Cyclones placed fourth in the team standings thanks to four runners placing in the top-35. This marks the fifth week in a row that Iowa State is the top-ranked team in the region. Oklahoma State finished 15th in Wisconsin. The Cowboys had a strong frontrunner in Ashenafi Hatte (13th overall), but would have liked to see their No. 2 through No. 5 runners finish a bit closer to him than 77th through 158th place. Minnesota took runner-up honors at the Roy Griak Invitational and comes in ranked third this week. The Golden Gophers fell by three points this past weekend to Duke. Tulsa and Kansas round out the top-5 in fourth and fifth, respectively. Destruction was the name of the game this past weekend for the top-2 teams in the Mountain Region. Northern Arizona, the No. 1 team in the region, rolled an otherwise stacked field at the Nuttycombe Wisconsin Invitational (46 points) while No. 2 BYU romped to its own team title at the Joe Piane Notre Dame Invitational (23 points). Colorado State and Air Force moved up in the rankings following their strong performances in Wisconsin. The Rams finished sixth in the Badger State, while the Falcons took fourth place. Colorado finished eighth in Wisconsin and dropped to fifth on the list. This is the first time in program history that the Buffs have been ranked outside of the top-4 in the Mountain Region. Nothing changed at the top of the Northeast Region as Syracuse and Iona remain No. 1 and No. 2 for the seventh week in a row dating back to last year. The Orange didn’t run and the Gaels’ performance in Wisconsin (17th place) wasn’t enough to rock the boat. Army West Point vaulted from No. 7 to No. 3 following an impressive showing at the Paul Short Run. The Black Knights finished a game third behind Utah State and Virginia Tech. This is the highest Army has been ranked in the Northeast Region in program history. Stony Brook and Columbia round out the top-5 in fourth and fifth, respectively. There is a new No. 1 in the South Region as Ole Miss takes over the throne for the first time since Week 5 of 2017. The Rebels, who didn’t race this past weekend, are still riding high off their effort two weeks ago at the Coast-to-Coast Battle in Beantown. Tennessee comes in at No. 2, its best billing in program history. The Volunteers placed 23rd in Wisconsin this past weekend and were led by the continued emergence of Zach Long. Former No. 1 Alabama fell from No. 1 to No. 3 after a rough day in Wisconsin. The Crimson Tide only had four runners finish the race as they didn’t record a team score. Belmont (up from No. 7) and Florida State (down from No. 4) round out the top-5. There were very few changes to the South Central Region between Week 3 and Week 4. Arkansas is still No. 1, followed by No. 2 Texas, No. 3 Texas A&M and No. 4 Rice. The Longhorns weren’t able to knock the Razorbacks off their perch by virtue of what they did this past weekend in Wisconsin, while the Aggies took their talents to Chicago and the Owls went up to Kentucky for the Louisville Classic. UT Arlington jumped from No. 9 to No. 5 this week. Virginia is still No. 1 in the Southeast Region, but Eastern Kentucky is hot on its heels. The Colonels finished 12th at the Nuttycombe Wisconsin Invitational behind a strong effort by James Sugira at the front of the pack. Sugira placed fourth overall and contended for the lead throughout most of the race. EKU is now ranked No. 2, its best billing since it was No. 1 for five weeks in a row in 2016. Virginia Tech finally got on the course and fought for the team title at the Paul Short Run. The Hokies finished runner-up to Utah State and moved up to No.3 from No. 7. NC State and Furman round out the top-5 in fourth and fifth, respectively. Nothing changed in the top-3 of the West Region as No. 1 Portland, No. 2 Stanford and No. 3 Washington all handled business in their most recent meets. The Pilots finished third at the Nuttycombe Wisconsin Invitational with a small spread, while the Cardinal dominated its own Stanford Invitational with 26 points and the Huskies are still wagging their tail following the Coast-to-Coast Battle in Beantown two weeks ago. The biggest jump of the week belonged to Boise State after it finished fifth in a stacked field in Wisconsin. The Broncos are now ranked fourth in the West Region, its best ranking since it was third four combined times between 2016 and 2017. Oregon slid from No. 4 to No. 5. This is the first time the Ducks have been ranked fifth in the West Region since 2011.